PEUGEOT’s all-new Partner was named ‘Van of the Year’ at the very first Fleet World Great British Fleet Awards held in London yesterday. All-new Partner was presented with the accolade during the awards ceremony at the Novotel London West. The all-new PEUGEOT Partner’s award tally did not end there, as the stylish newcomer also won the ‘Small Van of the Year’. 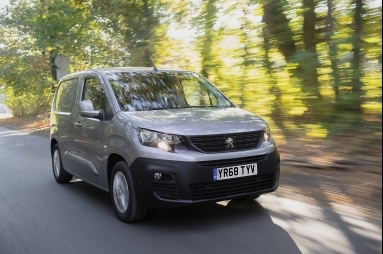 “The all-new PEUGEOT Partner is such a departure from its predecessor and such an improvement over it, that this was an easy choice for the judges”, said Van Fleet World Editor Dan Gilkes, “The small van market is hugely competitive and incredibly diverse. Outgrowing its car-derived origins, this class of van now has to cover everything from a 600kg, 3m3 compact LCV, through to a 4.4m3 long wheelbase model with a one-tonne payload. “The all-new PEUGEOT Partner has all the bases covered. Offering two wheelbases with two body lengths, the van delivers a load-hauling solution to suit all operations. A revised three-seat Multi-Flex cab, with fold-flat passenger seating and load-through bulkhead provide real versatility, while all-new Partner Crew Van models deliver a truly versatile combination of goods and people-carrying ability. Even though it has only been on the market for a matter of months, the all-new PEUGEOT Partner has already collected a string of awards. This started with the 2019 ‘International Van of the Year’ award at the IAA Hanover Commercial Vehicle Show last September, then in December, it was awarded both the 2019 ‘Light Commercial Vehicle of the Year’ and ‘Light Van of the Year’ at the 2019 What Van? awards. It has also been a strong start to the year winning the ‘Small Van of the Year’ award from Company Car and Van magazine. The UK is the third largest market for PEUGEOT with its UK Headquarters located in Coventry. The UK car line-up includes the 108, 208, 308, all-new 508, 2008 SUV, 3008 SUV and 5008 SUV supplemented by people-carriers and a van range that includes the all-new Partner, Expert and Boxer. The standard car and van line-up is supported by Electric Vehicles. The range includes the iOn and the Electric version of their most popular small van, the Partner Electric.